Miles's April 9, 2006 Unitarian Universalist Sermon: "UU Visions"
If you have been reading this blog, it won’t surprise you to learn that I am a preacher. I grew up a Mormon. (Indeed, my grandfather, Spencer Woolley Kimball, was the 12th President of the Mormon Church, from 1973 to his death in 1985. That puts him in a line of Mormon Prophets that begins with Joseph Smith and Brigham Young.) In the middle of my undergraduate years, I served a Mormon mission, preaching Mormonism in the Tokyo North Mission in Japan from 1979 to 1981. And it is hard to count how many Mormon sermons and lessons I gave both before and after my missionary service in Japan. But I am a Unitarian Universalist now. For all practical purposes, I left Mormonism early in 2000, though I am still technically a Mormon Priest and Elder. Since the Fall of 2000, I have been a member of the First Unitarian Universalist Congregation of Ann Arbor, Michigan. 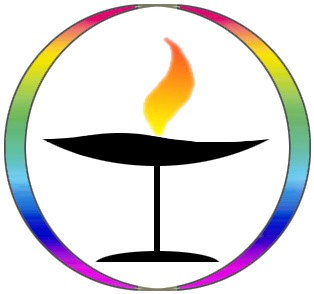 Every Spring since 2005, by invitation, I have given a sermon as a lay preacher at a nearby congregation: the Community Unitarian Universalists in Brighton (CUUB). This is my second sermon at CUUB, which is the one most relevant to what I have been trying to do so far with this blog: present a vision of how the world could be. This post jumped the gun a little. I intended to just put the text of the sermon in a Tumblr draft to edit later. Doing that as I was packing for my trip to an economics of risk and uncertainty conference in Toulouse, I published it. In any case, this was the introduction it needed. You can see in it some of the beginnings of themes I have pursued in this blog. And I will use this concept of a “vision” in future posts. One of the scriptures that Bill Clinton quoted on the campaign trail was from Proverbs, chapter 29, verse 18: “Where there is no vision, the people perish.”He was using the word “vision” not in the sense of a divine revelation, but in the sense of an ideal—an image of how the world could be and should be, and some ideas of how to work toward that goal.Each one of us, in our personal lives, is guided by visions of how our own lives could be and should be and how to work toward those goals; and in our public lives, we are each guided by visions of how the world could be and should be and our ideas of how to work toward those goals.These visions are every bit as much a part of who we are as our beliefs about the origin of mankind, God, heaven, hell, and the reason evil exists. Unitarian Universalists have the tradition of credos: personal statements of belief.This sermon advocates a corresponding Unitarian-Universalist tradition of sharing “visions”: personal statements of the kind of world we would each like to work towards creating.Just as there are now classes on “Building Your Own Theology” there could be classes on “Creating Your Own Vision,” culminating in the sharing of those visions with the congregation.In the meantime, before such classes exist, we can struggle on our own to write down our individual visions and share those with each other. Professionally, one of the big mysteries I struggle with is the fact that rich nations like the United States and Japan have been getting much richer, but not any happier. [Scientific note: Betsey Stevenson and Justin Wolfers have argued persuasively that this is not true for Japan.I had not yet read their paper at the time I gave the sermon.] The fact that we [the U.S.] are not getting any happier does not necessarily mean that we are making a mistake in our way of life.For example, some of our riches are spent on medical care that lengthens our lifespans, which is surely, other things being equal, a good thing.And there are many other worthy goals one might have besides happiness.But the fact that we are getting richer does mean that we have more and more choices (at least as a society), and we need to be ever more thoughtful about the choices that we do make.If, as a society, we are not managing to turn our greater riches into greater happiness, we should either figure out how to be more effective at adding to national happiness, or make sure that we are on the way to achieving some other goal that we value as much or more. As the set of choices we have increases, one of the most precious resources we can have is a knowledge of our own deepest desires.What is truly important? What is it that I really want most of all? Why do I want it? Is there something deeper that stands behind that desire? If I had to choose, which would I choose? We deal with these questions of what we really want every day.For example, setting priorities often means deciding what you don’t have time to do, because there are more important things to do. One clue to our deepest desires is what lights us up and gives us an inner glow just to think about it.This kind of enthusiasm is especially valuable when one of the things that lights us up and gives us an inner glow is getting in touch with a desire for the welfare of others as well as ourselves. Today is Palm Sunday.Two of the things we know most solidly about Jesus are that he came to Jerusalem at this season to meet his death and that he taught as a central principle the Golden Rule: “Love your neighbor as yourself” and “Do unto others as you would have others do to you.”As my friend and fellow UU economist Chris Carroll said to me two weeks ago when I saw him at a conference in Madrid, “Love your neighbor as yourself” was a big shift from the Roman quest for “undying fame.”Jesus was a magnet who permanently shifted the ethical compass of Europe and every place in the world influenced by the descendants of the Roman World, however often people ignore that compass. Kant translated the Golden Rule into his Categorical Imperative, which I think of as having two parts:First, think of how you would like the world to be.Then, act in a way that would bring about that world if everyone else also acted that way.In other words, Kant was saying that we need to create a vision of the world as it should be, then act according to that vision. Desire and love generate the image of a world as we want it to be, not only for ourselves, but for all people and for the whole web of life.Once we have an image of where we want to go, a crucial ingredient for making our plans before we pour our hope and faith into action is to ground ourselves in reality.I feel that Science is a sacred calling because it helps us to build a better world on a foundation of the truth about physical nature and the truth about human nature.Of course, any sacredness Science has comes from the sacredness of truth.Scientific truth, however hard to hear, however hard to bear, must never be sacrificed for the sake of politics, or we will not be able to see our way clearly to get where we want to go.In particular, a lack of devotion to the truth about what won’t work can leave us tilting at windmills like Don Quixote.But our knowledge will always be imperfect.Once we have learned as much and thought as hard as we can, we have to make a choice about what we will do.This is where hope and faith come in.Hope lights our way a little beyond the edge of our knowledge, and faith gives us the courage and energy for the ongoing struggle to help move the world toward the ideal we have chosen. How would a tradition of UU Visions work in practice? Visions, like credos, will be idiosyncratic.No two people will have exactly the same vision of how the world should be or of how to get there.Although our common humanity will generate many common threads in different people’s visions, these common threads may be obscured behind different political views, different modes of expression, and different beliefs about how the world works. The key to making a tradition of UU Visions work is to take our hard won tradition of tolerance for different beliefs about the origin of mankind, God, heaven, hell, and the reason evil exists and practice tolerance toward different visions.On the part of the one sharing a vision, the more personal the presentation, making clear the autobiographical and human wellsprings of one’s vision, the easier it will be on the listeners.But it would be sad indeed if people felt they could not share deeply felt aspects of their visions because they did not accord with the reigning political fashions. Indeed, in America as a whole it is sad that people find it harder and harder to talk calmly and productively about their political differences.Surely, we for whom tolerance is a birthright can do better—honoring that tradition of tolerance which was bought for us by the blood of martyrs for religious freedom. I think the reward for the hard work of sharing and listening and the even harder work of tolerance, would we would find common ground we had not realized, identify new directions for social action, and harness a greater fraction of our collective emotional energy toward doing good in the world.Collectively, we would be better able to lead the way toward prescriptions that will work in the 21st century, rather than relying on prescriptions developed in the 19th and 20th centuries.By bridging—or at least understanding—the differences in opinionamong ourselves, we will gain some morsels of wisdom that will help us to heal this divided land. Having proposed this explicit tradition of UU Visions, it would not be unreasonable for you to think that I had thereby volunteered to go first.So here goes.I hope what I have said up to now draws general approval, but from here on, I will get more idiosyncratic, and I am sure you will find something to disagree with.But that is the nature of visions. When I was a child growing up in Madison, Wisconsin, my father instilled in me a confidence that the world was a reasonable place, while my mother drove me to a high level of ambition.I was a miser, seldom spending much money except when I had a chance to go downtown to bookstores where I could by used Science Fiction books.I read many Science Fiction novels with heroes who, while human, possessed an amazing range of special skills, abilities and insights. They regularly saved the world, or more often, the galaxy.In the absence of videogames, I loved boardgames, especially wargames with little cardboard pieces on hexagonal grids. When I was 13, my family moved to Provo, Utah, where my father took a position as a professor at Brigham Young University’s new law school.Provo is in the heart of Mormon country, where every group of ten square blocks or so constitutes its own Mormon congregation.As a teenager, I appreciated having the neighbors know who I was and stop to talk to me as I made my way through the neighborhood.Growing up in a liberal Mormon household, at that time in my life Mormonism seemed open-ended.Indeed, the idea that esoteric wisdom could be found in a treasure trove of ancient documents and 19th century church doctrines fired my mind with the promise of intellectual discovery.I also found that praying hard led to subjective spiritual experiences that I valued highly. I went East to college, and decided to become an economist, since I thought it would be too hard to make my mark among aspiring physicists, and Sociology didn’t have a wide enough choice of classes.One thing I learned was that the objective of economics was not to make people rich but to help people in general to get what they want, whatever it was that they wanted.Every week I attended the University Branch of the Mormon Church in Cambridge, Massachusetts, where I heard very interesting lessons about psychological or spiritual virtues such as faith, hope and love and became more aware that the Book of Mormon put taking care of the poor as one of the highest religious duties, while the revelations of Joseph Smith taught that one should devote all of one’s money, time and other resources to the building of “Zion,” where “Zion” was a word referring to the ideal society, imagined as a society with the Mormon Church at its center, centered on families, extended families, and community. In addition to marrying and raising a family, and beginning my career as an economist, the next two decades led to my estrangement from the Mormon Church, as you heard last time.This process led me to a greater appreciation for freedom, especially freedom of thought.I remember being deeply moved by one of my children’s patriotic school plays, filled with gratitude for this country that could produce the Bill of Rights.I also learned something of the trials of fire people often go through to champion the truth in the simple sense of “just the facts.”I learned that someone has to work hard to generate every bit of justice there is in the world.Finally, I realized to my dismay how inegalitarian I had been in my marriage, despite being what I had thought was a very enlightened Mormon male. Bereft of the particular world-changing plans of Mormonism, I find myself trying to recover a sense of mission by trying to figure out how I can make a difference in the world.I find myself studying happiness in hopes there is a way to help people be happier.I do think it is important whether as a nation, fifty years from now we are a rich and happy country or a rich and unhappy country. As an economist, I also find myself trying to identify more precisely what people want the most so that public policy can make appropriate tradeoffs.Among other things, identifying what people want tells how they will respond to incentives, and some of the research I have been involved in suggests that people are likely to respond quite strongly to tax incentives.My graduate school advisor, Greg Mankiw, recently stepped down as the head of the President’s council of Economic Advisors.I told him that I was one of the few supply-side liberals. There are so many important things for the government to do: make sure people have good medical care, and that burgeoning epidemics are stopped in their tracks, control crime, support scientific research andmanage the complexities of foreign affairs, including promoting democracy and economic development around the world.But every bit of taxation has the potential to distort the economy and thereby hurt people’s welfare.Some tax revenue can be raised by penalizing things that should be penalized anyway, such as carbon dioxide emissions, legal drug usage and purchases of goods for which displaying social status is a big part of the motivation.But we will still need more revenue to do all of the things that need to be done, and I worry about where we can get that tax revenue without causing the kind of relative economic stagnation I see in France and some of the other European countries.If we can find a way to do that, what it will look like is an arrangement in which we are all caused to work very hard in order to help those in need and otherwise make sure that the things that need to get done get done. Even if tax revenue can be raised in a way that does not do too much damage, social programs to help people can also have bad incentives.One big exception is that as far as I can tell, giving all children a good education has only positive incentives.I feel that the fact that we fail many children in this duty of giving them a good education is one of our biggest moral failings as a nation, and anyone who stands in the way of achieving that goal of a good education for all children should feel very bad.We should do whatever it takes.In particular, we should experiment with many different approaches, with no holds barred, until we find the one that works. Many things that need to be done to make a Great Society are not the work of government at all, but the proper work of companies, families and churches.In the coming century, besides managing technological progress and the integration of the world economy so that all people in the world can be rich, one of the key tasks of employers is to figure out how to make jobs more challenging, rewarding and fun.I believe that making jobs fun will be one of the key sources of competitive advantage in the coming years, so I am hopeful that companies will rise to this challenge.If they do manage to make jobs more challenging, rewarding and fun, many people may want to retire later, perhaps rescuing Social Security from insolvency. Strong marriages, parent-child relationships, sibling relationships and extended families that love and support one another are important for people’s health and well-being.Life seems a lot more meaningful when someone close to you cares about you as an individual.I am deeply moved when I see many places in the world and some places even in our country extending the benefits of marriage to gays and lesbians, as well as heterosexuals.Beyond the family, churches serve many functions, providing a sense of community, friendships, inspiration, ideas, comfort and a place to celebrate life’s transitions.I see agnostic religions, such as Unitarian-Universalism as important because they provide the benefits of religion without requiring people to believe things they simply cannot believe.I have a hope that Plato was wrong about the necessity of a “noble lie” to make a community work.If we are skillful enough, can’t we build a wonderful tight-knit community on a foundation of truth and freedom? Besides a legacy of political and economic freedom, policies that do not bankrupt the nation, and the countless instances of individual mentoring of the next generations, the greatest gift we can give to the 22nd century is the scientific and technological research that we do and the enduring literature, art, movies and games that we create.I have not lost my enthusiasm for the Science Fiction goals of exploring and colonizing the Solar System and ultimately the Galaxy.I love the notion of my Planetary Scientist friend John Lewis in his book Mining the Sky that colonizing the Solar System will make it possible to support many more artists, writers and directors, so that we will have more works that can thrill as many people as the Harry Potter series, or rise to the level of Lost. In the even more distant future, truly amazing things may happen.I hesitate to spell out all my hopes and dreams for that more distant future, lest I sound as if I am off my rocker, but I do think we should forge ahead laying the foundation for future wonders.Perhaps some day human beings will overcome death itself.Unfortunately, I believe that all of us here today will die, but perhaps we will be part of one of the last few generations of human beings to die.Like all human beings since the beginning of history a few thousand years ago, we belong to the critical years of the Dawn of Humanity.Let us rise to the challenge of envisioning a good future for humanity.I believe that Unitarian-Universalism in particular can make a big contribution to such a future, since as a religion, we have faced up to our own responsibility for the future of our world and of our species.